I performed a wedding yesterday. Nothing especially odd about that–I perform 7 – 12 weddings a year. What made this one notable (for me…they are all notable for the couples involved) was the intensity of the interaction between the couple underneath the huppah (Jewish wedding canopy). I’ve experienced this under the huppah before. It hasn’t happened often, but it has happened. Yet this time it took me completely by surprise. In all the other cases, I’ve known the couple had this connection going into the ceremony, and expected that focus. This time, it came at me from out of the blue. Most often, couples who experience this love focus on one another under the huppah have a deeply spiritual component to their relationship…and that tends to come out in our conversations. It doesn’t mean they love each other more than other couples I marry, but it tends to mean that they conceptualize the relationship in spiritual terms, often regarding the relationship as possesing salvific power. During our conversations, yesterday’s couple never talked about their relationship in that way, and I’m not sure that they consciously regard their relationship that way. Yet under the huppah yesterday, the intensity of their connection was electric. I love doing weddings. To paraphrase, even when it’s bad, it’s good. Weddings are feel good events. Sometimes I feel like it didn’t go quite as well as I might have liked (rarely), but I almost always feel like I’ve been a part of a powerful experience for the couple and their family and friends. It’s a part of why I became a rabbi: to help create meaningful ceremonies for people at critical moments in their lives. I strive to make every wedding a mean ingful and spiritual experience for the couple. Rarely, however, is it a spiritual experience for me (which is as it should be). Yesterday was a deeply spiritual experience for me, as I bore witness to their love. Sometimes, when we expect it least, the Divine shows up and reminds us what really matters. I’m not posting here as much as I have been recently. I realized yesterday that it had been weeks since I’d been over to Ravelry. I feel like I’m constantly running behind. So where is all of my time going? Gardening. The seeds have sprouted, and many have been transplanted. Also, as I mentioned last week (I think), I got the front yard cleaned up. Passover: Getting stuff ready for the congregational seder last Sunday took more time and energy than I expected, somehow. Preparing for Weddings. The summer wedding season is coming up, and I’ve been meeting with 1 – 3 couples a week in preparation for upcoming weddings. CubeSpace. We’re getting ready for a big open house on May 14, and trying to get the word out about that. In between all of this, I’ve been doing a little knitting, trying to keep my sanity in place. I’ve concentrated my knitting on a single project for a while now, since I felt like I wasn’t seeing any progress on anything while splitting my time between my 4 projects. I’ve been working on Eva’s socks, and am finally up to the ribbing on the first sock (it’s a toe-up design). I switched to the magic loop method of knitting recently, and am finding it nice, especially in terms of not losing stitches off the needles when I shove them in my pockets. In a nutshell, that’s life of the last week or so. 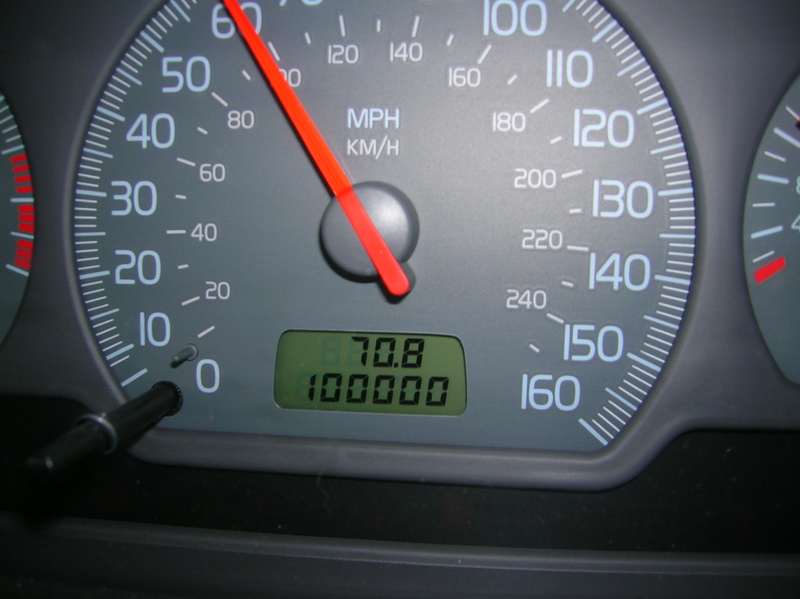 Yep, 100,000 miles on the car. 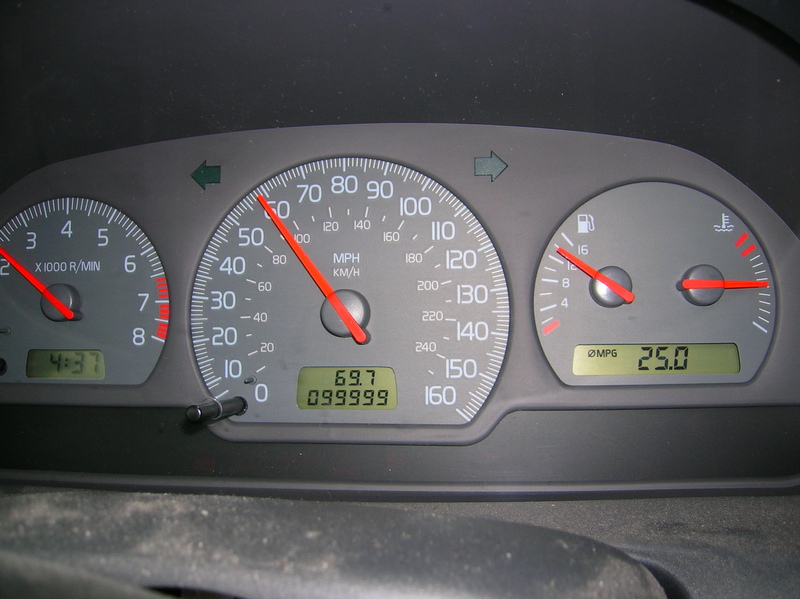 When we got the car, in October 2001, there were roughly 20,000 miles on it. A lot has changed since then. That was the car I used to drive to my student congregation, Beth Abraham, in Bridgeton, NJ. I served them for two years, but the congregation no longer exists. It closed up shop about a year ago due to declining membership (which was mainly the result of the changing demographics of the community). This is the car we drove to Blacksburg, VA to meet my first niece, and in which we again traveled to Blacksburg with my grandparents so they could meet their great-granddaughter. I drove this car for the last three years of rabbinical school, as I progressed from a frustrated and often angry student into a much calmer and more spiritually centered rabbi. This was the car I used to get to the Reconstructionist Rabbinical College for three years, and which my wife used to ferry my grandparents to my graduation (I think…I could be wrong about that). In this car I had many conversations with classmates as we drove to and from school, about hopes, about dreams and about disappointments. When I graduated from rabbinical school, and we decided to move from Philadelphia to Portland, I drove the car cross-country. A 7 day reflective period of driving, watching the landscape (it may be the only cross-country drive I’ve done that didn’t include a stop at Wall Drug). This is the car we used as we were setting up CubeSpace. Driving around town to look at potential locations, seeking out vendors for everything from phones to furniture to coffee. Finally, this is the car I’ve used this year, going back and forth to Salem, where I’ve been serving a congregation. Over the past 6.5 years, this car has driven me to more weddings than I can count, more funerals than I can clearly remember. I’ve sat in the car in the rain waiting for families to show up at the graveside. And I’ve hung out in car waiting for a couple to show up for a wedding rehearsal. In the last few years, I’ve of course done some knitting in the car as well (not while driving). While Eva’s been driving, or while waiting in the car for something to happen; waiting to pick up someone. As the car turned over to 100,000 miles, I was excited about the milestone. Now, thinking back two weeks to when it happened, I’m remembering all the miles it took to get there. I’ve been running too hard the last week. Over the course of the weekend I led 2 shabbat services for the congregation, performed a marriage, taught Sunday school, had a ritual practices committee meeting, tutored folks for a bar mitzvah next week, conducted a funeral, led a shiva minyan and drove about 400 miles in the process. I’m tired. On the other hand, I feel very fulfilled as a rabbi. This isn’t a pace I can keep up, but I feel like I’m really making a difference in people’s lives, which is why I became a rabbi. A photo of the driving this weekend, which for the most part was pretty bad. Lots of rain, some incredibly thick fog, lots of darkness. Have I mentioned I’m tired? There are weeks when my attention is more on CubeSpace, and there are weeks when my attention is more on the congregation (there are also weeks when my focus is more on knitting, but we won’t talk about that now). This is very much a “rabbinic week.” I am simultaneously preparing for the death of a congregant, a bar mitzvah and a wedding (the wedding isn’t actually members of the congregation, but definitely falls into the category of rabbinic work). Moving between these three lifecycle events is a bit of a challenge. They, needless to say (and yet I’m going to say it anyway), have three very different moods, and the rabbinic role is different in all three. For a family awaiting a death, the rabbi is present to offer solace and comfort. For boys becoming bar mitzvah (it would also be true for girls, but in this case it happens to be boys), my role is more that of coach and teacher. For a couple about to be married, I serve as counselor and master of ceremonies, helping ensure that the wedding comes off as they want it to and that they are able to be focused on what matters when the day arrives. Each of these three events are enormously important occasions in the history of their respective families. These are, literally, once in a lifetime events. It is vital that I bring an awareness of that to my conversations with families. At the same time, part of my role is to be able to say, “what you are feeling is normal,” based on the fact that I am in close contact with each of these events several times a year. I attend 5 – 10 weddings a year. Perhaps half as many funerals, and a far more variable number of bar or bat mitzvah celebrations. My role at these events is not that of the mourner, or the bride or groom, nor the young adult entering the Jewish community, but to be deeply empathetic with those people, and to lead them through it. Which brings me back to this week. Trying to shift gears so quickly between joy and sadness is confusing. The one constant between events is that they are stressful. But I feel like I’m beginning to experience some emotional disjuntion. Not necessarily in a bad way, but in a way that highlights the emotions of each events. Being present at lifecyle events is one of the reasons I became a rabbi. It is one of the most rewarding parts of what I do. When multiple events coincide, as they have this week, the rewards are highlighted, but I’m also much more aware of the potential for becoming emotionally drained. I am not yet running on empty. I cannot imagine officiating at a funeral without grieving with the family, or a wedding without celebrating. The real question is, what do I look like the day after. I guess we’ll find out next week.